Welcome to the Bucks County Chapter, National Society Daughters of the American Revolution (NSDAR or DAR). Our chapter serves the greater Doylestown area of beautiful Bucks County, Pennsylvania. 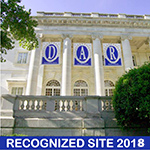 Established in 1925, the Bucks County Chapter, NSDAR, has a long history of serving our community to promote historic preservation, education, and patriotism. Please explore the menu above to learn about our organization and chapter. If you would like more information about becoming a member, please contact us. All photos courtesy of Lucina Verish, unless otherwise noted.